Updated: Dec. 23, 2014 at 08:56 p.m. Defensive end: Calais Campbell, Robert Quinn, Cameron Wake, DeMarcus Ware, J.J. Watt, Mario Williams. It's great to see Campbell finally make the team. He was the best active player to never make the Pro Bowl, so this was long overdue. It's impressive that he made the team at such a stacked position. Quinn started the season relatively slow, but his strong finish merited a Pro Bowl nod. Ware proved he still had good years left after getting cut by the Cowboys. Williams made it over teammate Jerry Hughes and worthy options like Muhammad Wilkerson and Everson Griffen. Watt is headed for possible MVP votes and a Defensive Player of the Year award. Wake has been vastly underrated for years. This was a loaded position, but the voters did a fine job. Interior linemen: Marcell Dareus, Aaron Donald, Gerald McCoy, Dontari Poe, Ndamukong Suh, Kyle Williams. 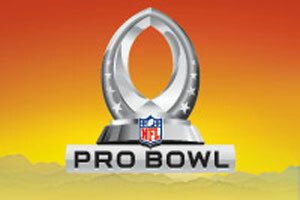 Three of the four starting Bills defensive linemen made the Pro Bowl, which is ridiculous. McCoy quietly had a monster year for the Bucs after getting a contract extension. Donald is one of three rookies that made the team. Poe has made the team in two of his three seasons. Barwin deserved to be recognized for his breakout season. Miller had a nice comeback season after his torn ACL, and Houston is among the best pass rushers in football. Dumervil started the year getting fewer snaps, and then finished like a monster. Hali and Matthews seemed to make the team based more off reputation. It's not like they had terrible seasons, but Matthews did not make the same impact as Detroit's DeAndre Levy, who takes over from Campbell as the best player never to make the Pro Bowl. Inside linebacker: Luke Kuechly, C.J. Mosley, Lawrence Timmons, Bobby Wagner. Kuechly didn't play at a DPOY level this season, but he's still the class at his position. Injuries to NaVorro Bowman and Patrick Willis helped open some spots at a formerly loaded position. Mosley, a rookie on the Ravens, capably filled the void. Wagner has probably been the biggest impact player at the position and deserves this spot despite missing games to injury. Cornerback: Vontae Davis, Brent Grimes, Joe Haden, Chris Harris, Patrick Peterson, Darrelle Revis, Richard Sherman, Aqib Talib. The "shutdown cornerback" is supposed to be a dying breed, but this is the best eight pack of players in the Pro Bowl we've seen in a long time. Sherman remains the class of the position, but Revis and Davis challenged him this season. Chris Harris made the leap to dominant this year, showing he could play inside and out. Talib showed that his revival in New England last year was not a fluke. Peterson and Haden had up and down seasons, with Peterson especially having plenty of rough games. But he's asked to do more than any cornerback on this list. Free Safety: Tashaun Gipson, Glover Quin, Earl Thomas, Eric Weddle. Gipson got his due as a ballhawk for the Browns' defense. Quin was dropped by the Texans and helped to solidify an improved Lions secondary. Thomas and Weddle remain the class of the position, while Devin McCourty got left out in the cold. Strong safety: Kam Chancellor, T.J. Ward. We've got a few problems here. The NFL should just eliminate free and strong safety designations because strong safeties barely exist. Every safety in today's pass happy league needs to know how to do a little bit of everything. Just combine the two positions like coaches do, and let six players make it at the position. It's almost like voters were forced to vote in two well known names because there weren't other options. Chancellor missed a few games and didn't play well at all early in the season because of injury. Ward has been solid, but with plenty of mistakes in Denver. Antoine Bethea of the 49ers was absolutely robbed.